The New Zealand Government Railways - James Harcus was a Surfaceman for NZR. RMS Ruapehu was seconded by the Admiralty in WW1 to become a Troop ship like most British passenger liners. She was designated HMNZT79 (His Majesties NZ Troopship no. 79). James Harcus left NZ on the RMS Ruapehu from Port Chalmers Dunedin on 16 October 1914. RMS Ruapehu, troopers exercising on deck. RMS Ruapehu, troopers sometimes preferred to sleep on deck due to the hot weather conditions. James Harcus was part of the Australia and New Zealand Army Corps, ANZAC, who fought on the Gallipoli Peninsula in 1915. Google image. Gallipoli Landings, Anzac Cove, 25 April 1915. The Gallipoli Campaign began in February 1915 with a Naval attack which failed to force a way through the Dardanelles Straits and capture Constantinople (Istanbul). The Land invasion followed by the ANZAC on 25 April 1915. Stretcher bearers taking the wounded off the beaches, Gallipoli 1915. Hospital ships were waiting out at sea but these vessels were often overcrowded and the wounded had long delays for treatment. James Harcus, second row from back, second on left. Gun shot wound right foot, seen here convalescing in hospital in Cairo 1915. Otago Witness Newspaper, 28 July 1915. Two NZ Hospital Ships were funded by the NZ Government and the Public, the Maheno and Marama due to the increasing number of casualties at Gallipoli. 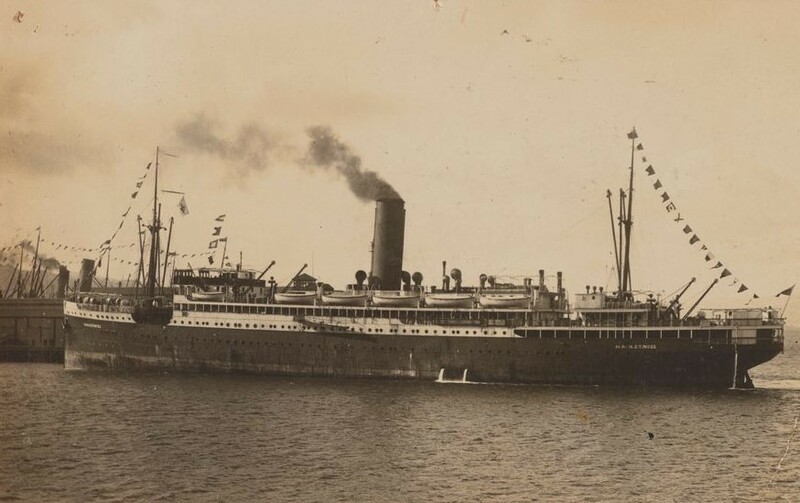 They were converted Union Steam Ship Company trans Tasman passenger steamers. 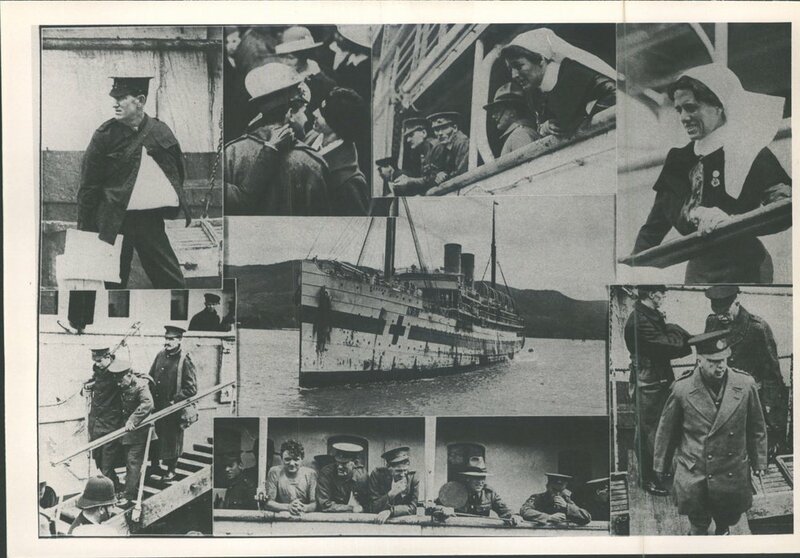 The above ship is the Maheno arriving in Port Chalmers with wounded soldiers later in 1915. She also carried thousands of wounded soldiers to nearby Greek islands Lemnos and Imbros from Anzac Cove during the Gallipoli Campaign. 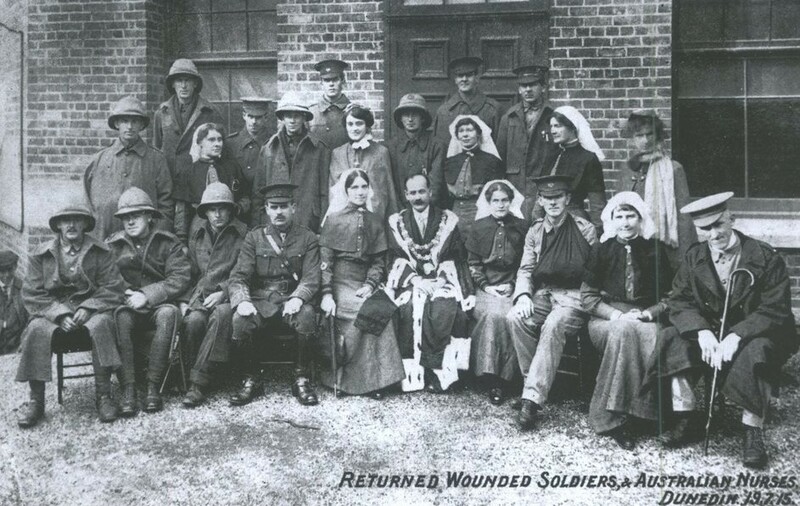 Examples of wounded soldiers who returned to Dunedin in 1915. James Harcus did not require nursing care and was referred to Outpatient treatment at Dunedin Public Hospital but he did not attend. Dunedin 1916 WW1. Reinforcements were needed to join the New Zealand Expeditionary Force overseas. James Harcus died in 1870 and is buried in Ruru Lawn Cemetery, Bromley, Christchurch, Block 44 Plot 377. WW100. 11 November 2018 marks the one hundredth anniversary of the end of the Great War, WW1. James Harcus served in WW1 from 1914-16 and was the youngest son of my GG Grandfather Robert Harcus from Eday, Orkney, who had nine children in total. I have focused on James' war experience to try and understand the reasons he may have enlisted, the conditions he fought in, particularly Gallipoli, where he was injured and the impact 'fighting for his country' had on him. It is a journey from the shores of New Zealand to Alexandria, Egypt, then to Suez and the Gallipoli peninsula in Southern Turkey and his return, 'invalided home' on a troop ship. James was born in Palmerston South, not far from the gold mining area called Macraes Flat, Otago, NZ on 5 March 1886. His father, Robert, was a farmer in Moonlight and James attended the Moonlight school from age 9-12 years. He never really knew his mother, Margaret Knox, as she died in 1900 after suffering consumption for many years. He had also lost two brothers; David in 1889 and John in 1903. James had a very loving father however and 6 surviving brothers and sisters who would have helped with his upbringing. Many of the children, when they were young, were needed to work at home but later James found work as a Surfaceman for the NZ Government Railways as the South Island and Central Otago was advancing with Steam Railway and track, first initiated by Vogel's public works schemes in the 1870's. A Surfaceman was a track worker who kept the railway bed in good repair. James volunteered for service 21 days after war was declared in 1914, so he did not delay. He was 28 years old, 5 feet 9 inches tall, weighed 186 pounds, had brown hair and grey eyes. His last address was given as Warepa, near Balclutha, South Otago as he worked on the railway there. This showed a great pride in his country and loyalty to Great Britain as his father was Orcadian and his mother Scottish. It also showed he had an adventurous and fearless spirit. NZ introduced compulsory conscription much later on 1 August 1916 and all men aged 20-45 had to register for conscription ballots. James was supporting the British Empire by 'doing his bit for his country' but there may have been other reasons why he signed up. He was the right age and would have got paid. He may have been looking for more adventure as he was single and free and his job as a Surfaceman for NZR, the county's largest employer, was primarily labouring outdoors in all weathers on his own or in gangs. The rail system and its large workforce supported the war effort and there may have been peer pressure about enlisting as over 5000 permanent employees on NZR as well as thousands of casual workers served overseas during WW1. Britain had declared War on Germany on the 4th August 1914 and NZ was in full support of mother England. NZ needed the British market for the trade of wool, frozen meat and dairy products. 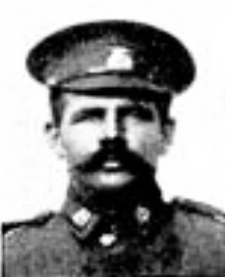 25 August 1914 - James enlisted at Dunedin in the Otago Infantry Regiment, OIR, 1st Battalion, 14th South Otago Company. The infantry were soldiers who fought on foot with rifles and bayonets. When he departed NZ shores for overseas service, he was in the Otago Infantry Battalion, part of the New Zealand Expeditionary Force. The NZEF was the title for the military forces sent by NZ who fought for the British Empire in Egypt, Gallipoli (Southern Turkey) in 1915 and the Western Front in Europe between 1916 and 1918. Called the First NZEF, the 'Main Body' had over 8,500 men, who had volunteered, and was formed of 2 Regiments, the Infantry and Mounted Troops plus the Field Artillery, Signal Unit, Medical, Veterinary and other support services. The NZEF Infantry Regiment was made up of New Zealand's four military regiments from Auckland, Wellington, Canterbury and Otago who each contributed a battalion of 1000 men. Many reinforcements were sent for later. James was in the Otago Infantry Battalion, OIB, and after Gallipoli in 1915, it was divided into 1, 2, and 3 Otago Infantry Battalion, and served on the Western Front from 1916 until 1918 in conflicts such as the Somme 1916, Messines 1917, Passchendaele 1917, Spring Offensive and Advance to Victory in 1918. The Units on board his ship, the RMS Ruapehu, included the Otago Infantry Battalion, Otago Mounted Rifles and NZ Medical Corps. They thought they were going to Europe and the Western Front but were off loaded in Egypt along with Australian Imperial forces to finish training and help defend the Suez Canal along with British soldiers, as this was an important British shipping route between Europe and Asia. The horses suffered badly as they were not suited to a desert environment or the terrain and many were not used. 5 November 1914, the British Empire including NZ and France declared war on the Ottoman Empire after Russia. The Ottoman Empire was dominated by the Turks but also included Arabs, Kurds, Greeks and others. It was one of NZ's first main WW1 enemies, (apart from German Samoa) and was a sophisticated empire who fought against NZ for four in the Gallipoli, Sinai and Palestine campaigns. 3 December 1914, James and NZEF men and horses disembarked the RMS Ruapehu at Alexandria in Egypt after 49 days at sea and steaming through the Suez Canal to the Mediterranean Sea. He then travelled by train to Cairo where a training camp was established nearby, called Zeitoun Camp. James trained in the surrounding hot desert sands which typified the terrain and conditions where future conflicts against the Ottomans (Turks) were likely to take place. 3 February 1915 - the defence of the Suez Canal against attack by Ottoman troops was the first combat for James. The Suez Canal, 101 miles long, connects the Red Sea to the Mediterranean and was a vital, shorter route for British ships from India, Asia or Africa rather than the long route around the Cape of Good Hope. 'The Turkish infantry approached from the east bank of the Suez and tried to cross but those in the water and the gullies were fired on and many Turks panicked and surrendered. The conflict was over by early afternoon and the Turkish force withdrew back across the Sinai towards Beersheba, having lost 1,500 troops'. Allied forces would remain to defend the Suez Canal from the Turks and Arabs, (who were not a well organised enemy then), and the NZEF and other troops were redeployed to Gallipoli and the Western Front. The Gallipoli peninsula was important as it guarded the entrance to the Dardanelles Straits. The Allied Plan was to break through the straits with British and French battleships to allow naval forces to capture Constantinople (Istanbul), the capital of Turkey and the Ottoman Empire. This Naval attack in February - March 1915 failed and a Land invasion was then planned for the 25 April 1915. James was part of the Australia and New Zealand Army Corps, ANZAC, who landed near Ari Burnu, now known as ANZAC Cove on the Gallipoli peninsula of Turkey. He served just 9 days before suffering an injury. The ANZAC name had been adopted in December 1914 to represent the combined NZEF and Australian Imperial Force Units. 25 April 1915, Gallipoli landings began by ANZAC troops. It was after 2.30pm when James and the 14th South Otago Company climbed off the Anneberg (Allied troop ship) into the tow boats. They were 2 km north of their intended landing place, a fortunate mistake? It was a natural shelter for the base of operations, but instead of arriving on flat land, each Otago Company in the NZEF was thrown immediately into the firing line when they waded ashore as the enemy, who outnumbered them, were already in the ravines and gullies above the beach, (Anzac Cove). Otago was sent left then recalled to Plugge's Plateau. Once above the beach, with shrapnel flying around them, they dug trenches to desperately defend their position. There was unparalleled suffering over the next few days, casualties were high and dead bodies lay all around them. The injured dragged themselves or were eventually carried on stretchers down to the beach. By 29 April 1915, the battle of the landing was over, there was no winner. The ANZAC had a landing foothold at Anzac Cove but failed to capture Mal Tepe or the north - south road and the Ottomans had failed to remove their invaders. At Helles, the British and French had failed to achieve a strong position on the peninsula, so it was a stalemate. "Due to a poor, uncoordinated plan, the attack went badly wrong. The Otago Battalion's move from Walker's Ridge to the head of Monash Valley took longer than expected and it was not in position when the Australians launched their attack. When the Otagos' finally charged out of Monash Gully, 90 minutes late, the forewarned Ottomans shot them down. At daybreak, the exposed nature of the New Zealand and Australian positions became apparent as they drew heavy fire from Second Ridge. When they withdrew, units of the Royal Naval Division tried to continue the advance, but also suffered heavy losses. The failed assault cost the ANZAC a thousand casualties and gained nothing." 3 May 1915 - James Harcus was wounded with a gunshot wound to his right foot, his war was effectively over. It is most probable that he was wounded in the Otagos' charge out of Monash as above, they suffered badly, losing approximately 500 men. he would have been removed from the front line to the Regimental Aid Post and then to the Casualty Clearing Station on the beach, before being taken in a 'lighter' to a Hospital ship, marked with Red Crosses, waiting out at sea. There were often only six nurses, four doctors and some orderlies on each ship with about 400 men. Conditions were awful, ships overcrowded and it took hours to reach a military or other hospital base, e.g. it took 3.5 days to get to Alexandria in Egypt. Those with more serious injuries went to Egypt, Malta or back to England, soldiers with less serious wounds were sometimes taken to Lemnos in Greece. A newspaper report confirmed James was in the General Hospital, Shebin el Kom, on the Nile Delta between Cairo and Alexandria as he was visited by Reverend Gavin on 15 June, who thought the wounded were better looked after in this smaller hospital than the larger hospitals in Cairo. Another report in mid-July has him in the Chaif el Kom Hospital in Egypt. The main allied hospital base during the Gallipoli campaign was Egypt and by 29 April, only four days after the Landings began, 2,489 casualties were admitted at Alexandria. Temporary hospitals also had to be constructed to treat wounds, dysentery and venereal diseases. James was discharged, convalescent from Alexandria in August 1915 and may have gone to Cairo to await his return home in September 1915. The wound he suffered meant he was not sent back to the front line. It was a 125 metre troop ship, built in 1912 by William Beardmore and Company and the route went via the Cape of Good Hope, South Africa. 30 October 1915 - James was among 500 soldiers who arrived back in Dunedin, NZ on the Willochra troopship. Medical arrangements were made first for the wounded and cot cases removed to hospital. The ship was then greeted by other officials, family, journalists and the general public on the wharves. The following day, Sunday, they were taken in motor cars to the large Drill Hall at Kensington and had lunch provided by the City Council followed by a Civic Reception with 'welcome speeches' by the Mayor, Hon. J Allen, Hon. G Russell and Rev. Balfour. Canterbury soldiers then left by special train and the North Island contingent by the Monowai. James went to a private address, 48 Forbury Road, Dunedin. James was advised to attend Dunedin Hospital Outpatients as only badly injured soldiers were admitted to hospital. In 1918, the Red Cross military convalescent Home and Hospital opened at Montecillo and still operates to this day. Plunket and Lady Ranfurly homes were also established throughout NZ during WW1 as care facilities for returned servicemen and to relieve pressure on public hospitals. October - 29 December 1915 - Medical Board Report James Harcus: Gunshot wound, GSW, Right Foot, injury to right foot, pain on walking, granted 2 months sick leave to recover. The report confirmed his disability was contracted in the 'Service' and caused by 'military duty'. The penalty for self - inflicted wounds then was death by firing squad but more likely imprisonment. Desertion or mutiny had the death penalty and five NZEF soldiers were executed during WW1. Soldiers often suffered from shell shock, now termed post - traumatic stress disorder, PTSD. 17 February 1916 - Final Discharge. James Harcus was 30 years old and confirmed as being medically unfit for active service although fit for employment in civil life. Total Service in WW1: 1 year 177 days. Overseas service WW1: 1 year 14 days. 16 October 1914 - 30 October 1915. Gallipoli CAMpaign, February - december 1915 A costly failure for the allies? Not only did the Naval attack fail on the Dardanelles Straits in February - March 1915 but the Land invasion, April - December 1915 has been described by veterans as one of the worst places to serve in WW1 with some of the fiercest fighting and conditions. Sanitation was a problem and body lice, diarrhoea and typhoid flourished. The stench of unburied, rotting corpses encouraged the flies which bred in the bodies. 'Letters from Hell', personal accounts from men who survived, confirm the appalling conditions they experienced and how they sometimes had to walk over the bodies of their colleagues in no man's land as there was no time to bury them. In my opinion, it did not matter where they first landed on the Gallipoli peninsula, as from the moment they came ashore, the Allies including the ANZAC, were undermanned and outnumbered by the Ottomans. There was always a shortage of water. Food, natural water, ammunition and other supplies arrived on ships and had to be landed on the beach which was difficult. The lived on 'tinned bully beef, hard army biscuits and jam'. As enemy trenches were often close, there were constant casualties due to bombs and enemy grenades. Medical services at Gallipoli were a shambles compared with the Western Front and could not cope with the number of wounded or those who fell ill with e.g. rampant dysentery. The wounded and sick had long, painful delays. Evacuations of the ANZAC troops from Gallipoli began on 15 December 1915 and 36,000 troops were shipped out for redeployment within 4 days. The British and French remained at Helles until January 1916. NZ suffered 8000 casualties, including 2779 dead, Australia 28,000 including 8700 dead. The French nearly 27,000 and British and dominion 115,000 casualties. Flooding of the trenches and disease also caused many deaths. The Ottomans paid a huge price for their victory with about 250,000 killed or wounded. James was fortunate and able to resume a normal civilian life and continue working for the NZ Railways. He married Fanny Louisa Stratton on 25 April 1917 at his home in Palmerston. They moved to Christchurch by 1928 where he continued to work for NZR until he retired. James died at the age of 84 years on 2 August 1970 and is buried in Ruru Lawn Cemetery, Bromley, Christchurch. He may have had mental and physical scars due to the atrocities he witnessed and conditions he fought in but he lived to a good age in a loving relationship. Fanny died in 1976 and shares the same cemetery plot. He was very appreciative of his family when he returned from Gallipoli, as noted by two loving tributes he put in the Otago Daily Times newspaper after his father died in 1918. His older brother, Robert junior, who fought in the Second Boer War in 1902, on his return, was not so fortunate and acted increasingly more peculiar to such an extent, he was declared insane and committed to a lunatic asylum where he died in 1912. NZ had a difficult decade after WW1, export prices fell and there was a shortage of manpower as NZ had lost the highest percentage of military aged men in the British Empire. 16,697, (5% of the male population aged 15-49 yrs), were killed and 41,317 wounded. Over 100,000 troops and nurses had served oversea, which was nearly 10% of NZ's total population of only 1.1 million in 1914. Of 10,000 horses sent, only 4 returned. The failed Gallipoli campaign and loss of young men was particularly hard for loved ones and communities and the Royal NZ Returned and Services Association, RSA, was formed in 1916 by returning ANZAC's to help provide support and comfort for service men, women and their families. The effects of WW1 continue to be felt, now 100 years later and we will always remember those who fought and gave their lives at Gallipoli/war on ANZAC day, 25th April, every year. James Harcus volunteered for military service at the beginning of WW1 and well before conscription in NZ. His war may have been brief compared to some, due to his combat injury, but he will remain an 'everyday hero' as he fought in some of the most arduous battles, particularly Gallipoli, in the legendary ANZAC force and survived. James was awarded the 1914-15 Star 31 May 1920, British War Medal 5 May 1921, Victory Medal April 1922 as well as the Gallipoli Lapel badge and Gallipoli Medallion 1969. His 'war experience' has been a fascinating story. His battalion motto 'Forever be Strong' was terribly appropriate, as if you survived WW1, the memories of the harsh conditions and horrific slaughter would always stay with you. Please contact me if you have any comments or questions and see My Story, Ancestral Roots in Eday Orkney for more information on the Harcus family. Hocken Library Snapshop, Maheno Hospital ship, Reinforcements Dunedin, Wounded Soldiers and Nurses in Dunedin. See also Resources RootsRoutes website for more information and if you have any comments or questions please contact me to discuss further.